The Randy Report: Cruz Supporter Steve Deace To Trump Supporter: "Stop Lying!!!" Cruz Supporter Steve Deace To Trump Supporter: "Stop Lying!!!" 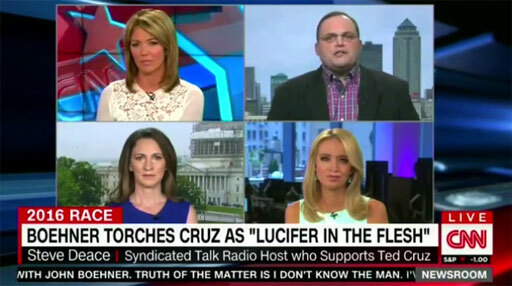 Iowa radio host and Ted Cruz supporter Steve Deace had a meltdown on CNN during a panel discussion about the current state of the Republican primary. With cries of "Stop lying!" Deace went on a rant accusing Donald Trump supporter Kayleigh McEnany of distorting the truth every day on national TV. “Kayleigh, I don’t know you. Seriously, do you have any integrity at all?” Iowa radio host Steve Deace said to Trump backer Kayleigh McEnany as CNN host Brooke Baldwin shook her head. Baldwin interjected to ask Deace to keep it professional as the conservative radio host continued to rip McEnany. “I am keeping it professional. She’s the one lying,” said Deace, who criticized McEnany for arguing that Cruz had silenced voters in Colorado by winning delegates elected at a convention. “There is no voterless elections. Every delegate is elected. Including Pennsylvania,” Deace continued. “This is the biggest lie and the biggest scam from a guy that lied repeatedly in the entire campaign and whose campaign is built on a lie.” He went on to repeatedly shout at McEnany to “stop lying,” accusing Trump surrogates of misleading the American people.